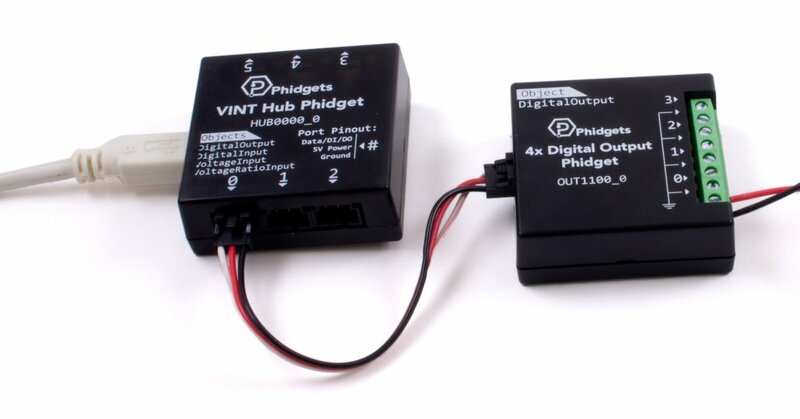 If the 3.3V digital output mode of your hub's VINT port is not powerful enough, or if you just need more digital outputs, this cost-effective output module has you covered. This board adds four 5V digital outputs to your VINT hub, allowing you to control LEDs, relays, and other logic-level electronics. See the Connection & Compatibility tab for a list of VINT Hubs. Each digital output is capable of pulse-width modulation, allowing you to select a duty cycle between 0% and 100% power. This is particularly useful for dimmable electronics such as LEDs or fans. Wiring is simple since each output terminal has a ground terminal beside it, leading to the board's shared ground. 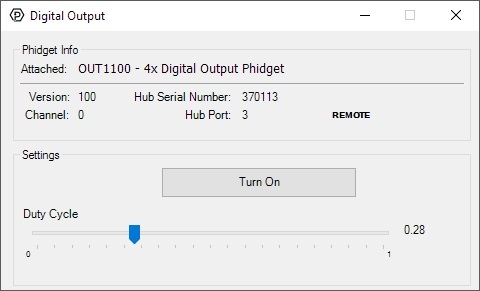 Connect the OUT1100 to the VINT Hub using the Phidget cable. Connect the positive end of an LED or small device that runs off of 5V to one of the digital outputs, and the negative end to the ground terminal. Now that you have everything together, let's start using the OUT1100! 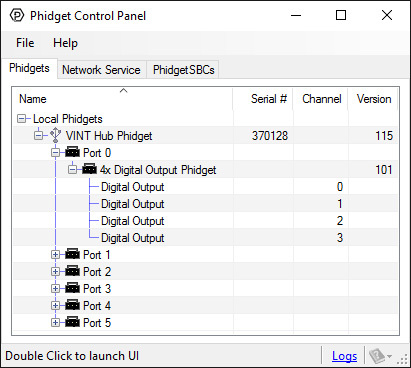 In order to demonstrate the functionality of the OUT1100, the Phidget Control Panel running on a Windows machine will be used. 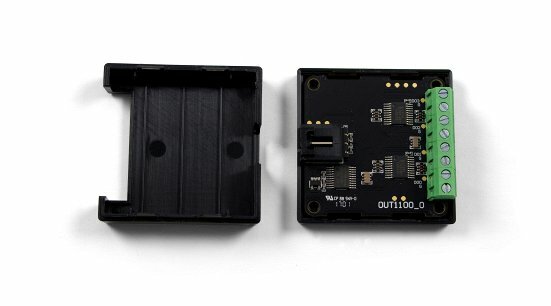 Linux users can follow the getting started with Linux guide and continue reading here for more information about the OUT1100. If the failsafe timer is not reset before it runs out, the channel will enter a failsafe state. For Digital Output channels, this sets the output to a FALSE state. On the OUT1100 this sets the output LOW. Once the channel enters the failsafe state, it will reject any further input until the channel is reopened. The digital outputs on the OUT1100 are slightly different than the digital outputs on Phidget InterfaceKit boards. To drive an LED with the OUT1100, simply attach the anode to one of the digital output terminals, and the cathode to the the corresponding ground terminal. The built-in series resistance will limit the current and keep the LED from burning out. 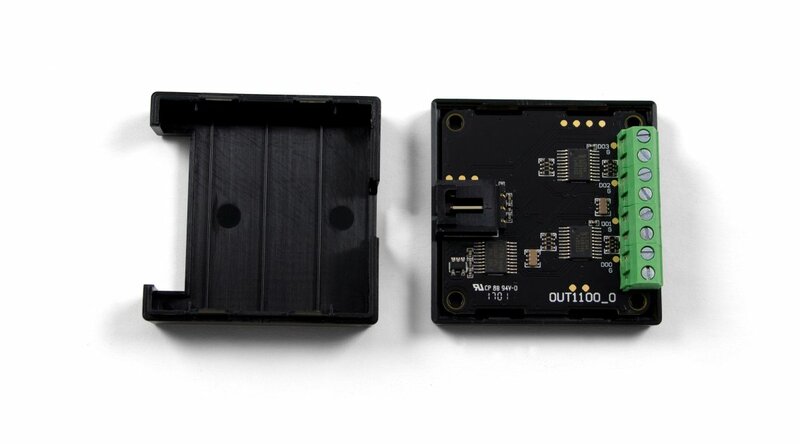 To control an SSR with the OUT1100, attach the positive + terminal to the output terminal, and the ground - terminal to the corresponding ground terminal on the OUT1100. 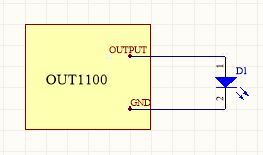 An inexpensive mosfet and flyback diode circuit can be used to control larger loads (such as relays) from the OUT1100. Be sure to use a Logic-Level MOSFET so that the +5V Digital Output is able to turn it on. Similarly, an NPN transistor could be used in place of the MOSFET, in cases where they may be easier to obtain. In some applications, particularly where there is a lot of electrical noise (automotive), or where you want maximum protection of the circuitry (interactive installations, kiosks), electrical isolation buys you a huge margin of protection. Driving the LED causes the output transistor to sink current. The maximum current through the transistor will depend in part on the characteristics of the optocoupler. 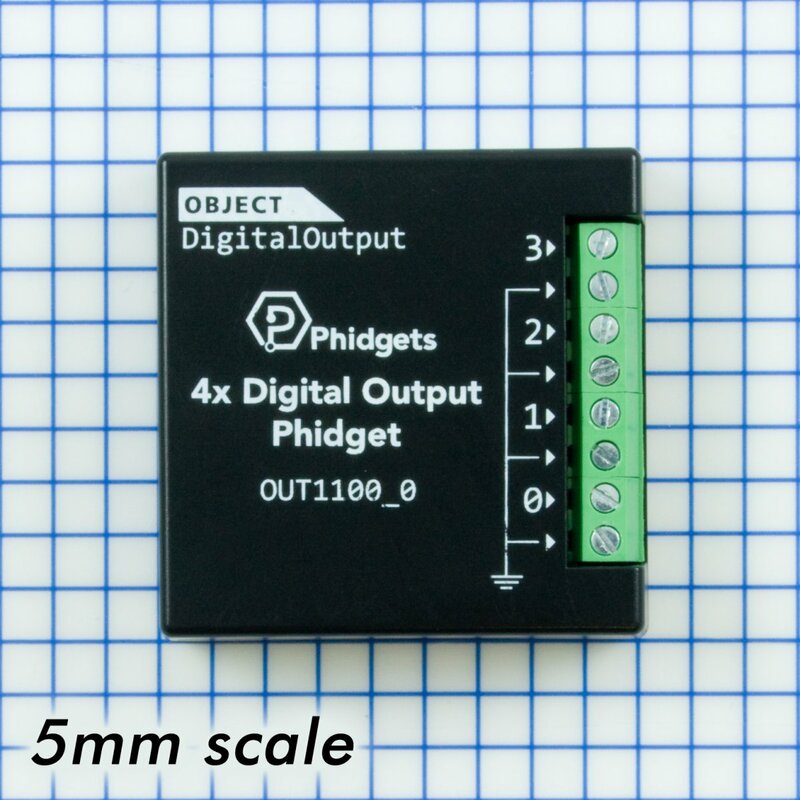 Note that in cases where many isolated outputs are required, you may want to consider using the REL1100 or REL1101, which are ready-made isolated digital output Phidgets.